Does Nature Inspire You Too? It’s the time of year again when we all look forward to the rain, cool weather and POST’s Wallace Stegner Lecture Series! This year, the theme for the series is Drawing Inspiration from Nature. Whether it’s a casual walk outside, an endurance challenge or inspiration for a passion like photography or native plants, the environment inspires creativity, problem solving, physical well-being and peace of mind. 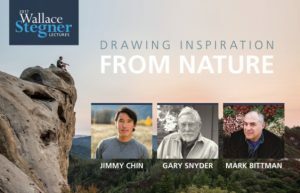 This year, we’re excited to welcome Jimmy Chin, Gary Synder and Mark Bittman to the stage of the Mountain View Center for the Performing Arts to explore their connection with nature and how it has influenced their life’s work. The proceeds from this event will go to support our work protecting open spaces, farms and parkland in and around Silicon Valley. Series subscriptions can be purchased here until November 20. Single tickets will be available to purchase on December 1. Wallace Stegner was a Pulitzer Prize-wining novelist, conservationist and longtime Bay Area resident. In 1993, Stegner helped launch the series and was slated to be its first host when he died tragically before the series began. As a tribute, the series were named in his honor.